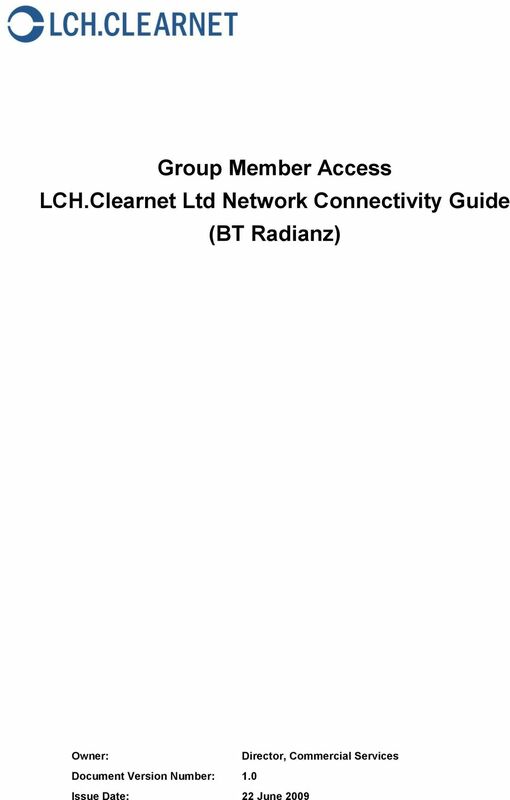 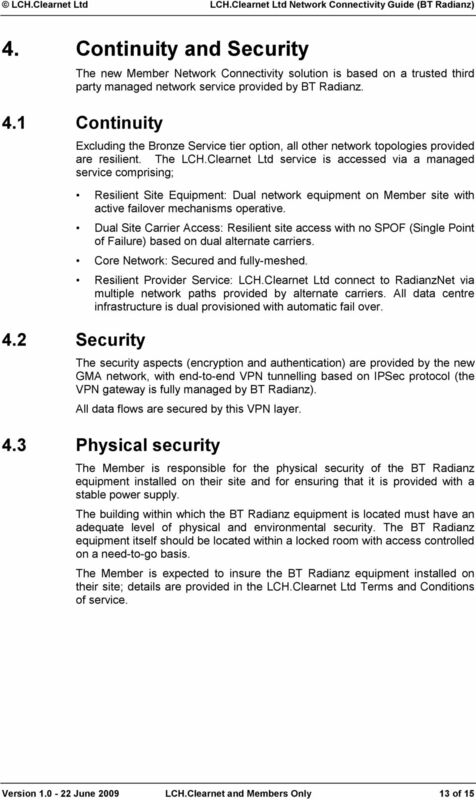 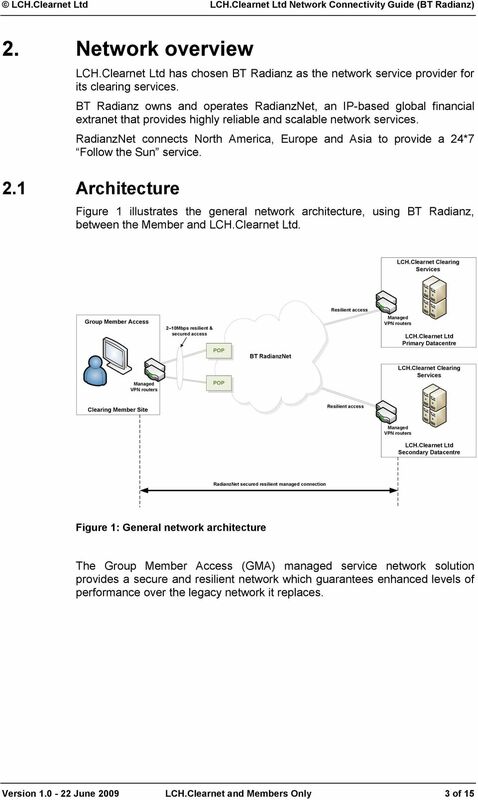 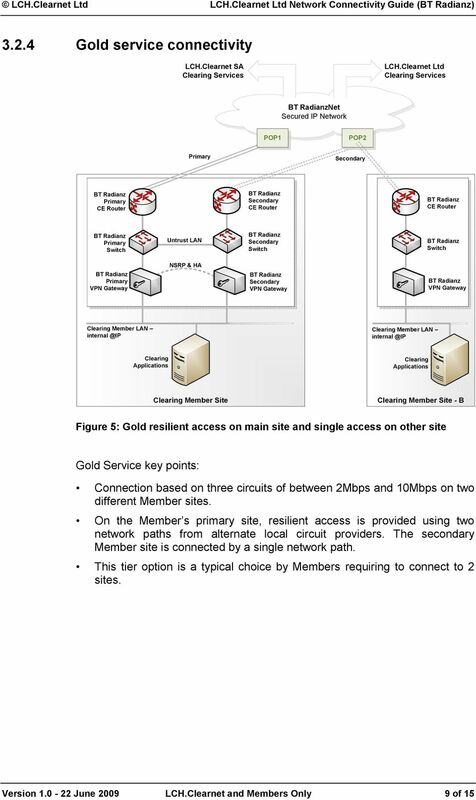 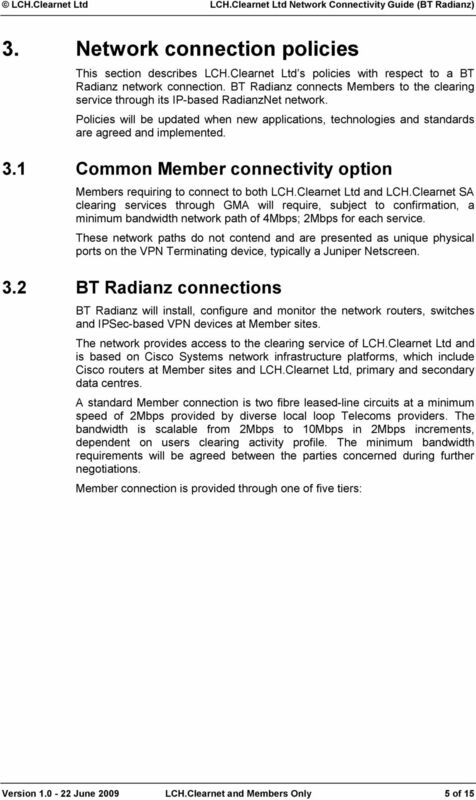 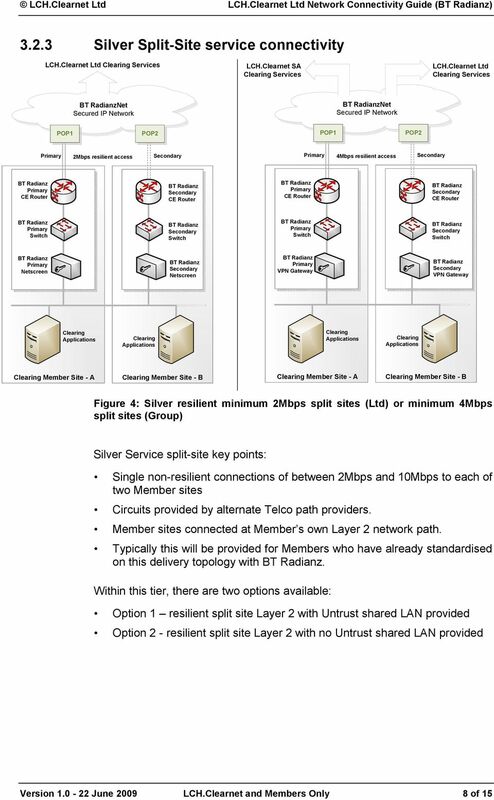 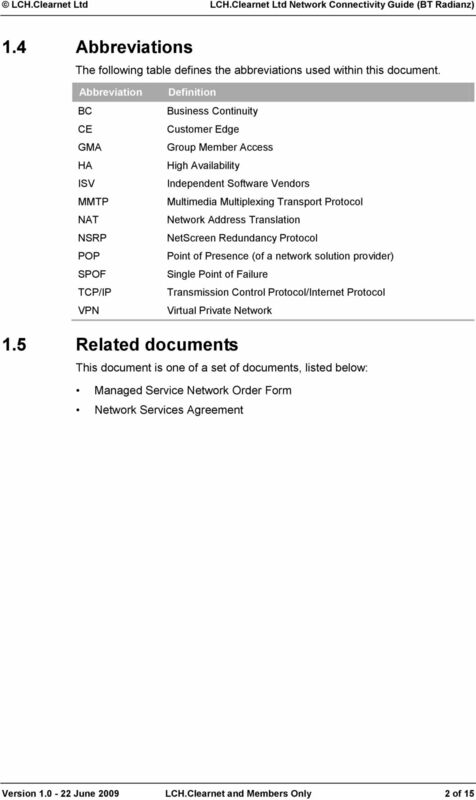 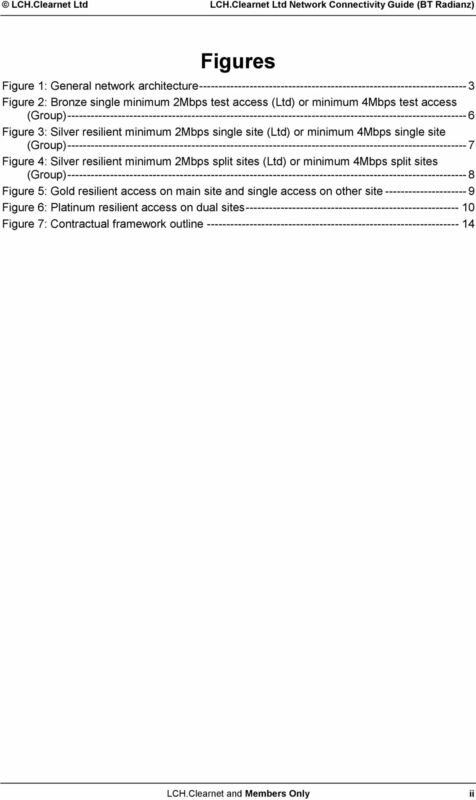 Download "Group Member Access LCH.Clearnet Ltd Network Connectivity Guide (BT Radianz)"
2 COPYRIGHT The copyright in this work is vested in LCH.Clearnet Limited. 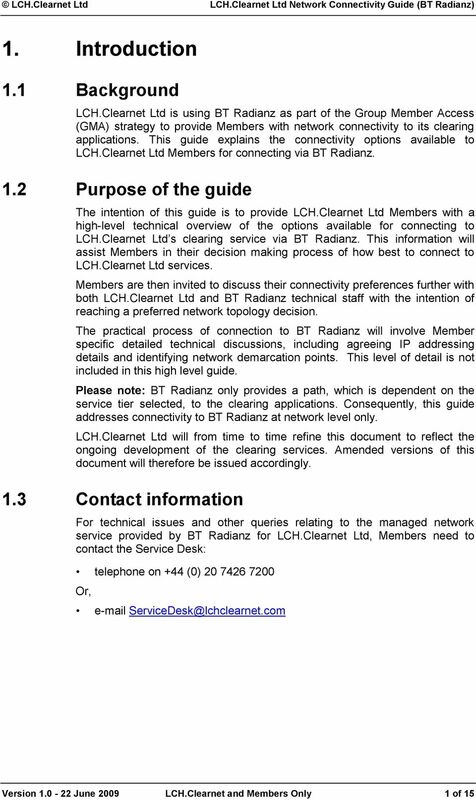 It must not be reproduced in whole or in part without the prior written consent of LCH.Clearnet Limited and then only on the condition that this notice is included in any such reproduction LCH.Clearnet Limited, 33 Aldgate High Street, London, EC3N 1EA LEGAL NOTICE This Member Connectivity Guide () does not constitute a contractual agreement between LCH.Clearnet Ltd, its clearing members or any other entities. 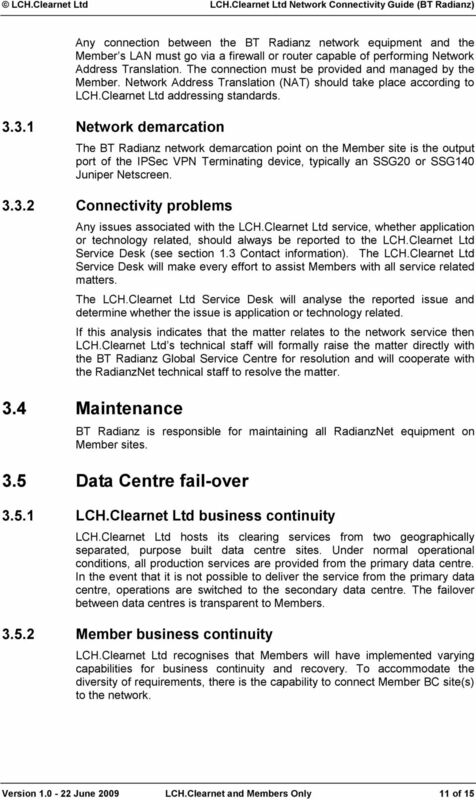 The contents of the Member Connectivity Guide () do not constitute a representation, warranty or undertaking of any kind to clearing members by LCH.Clearnet Ltd or. 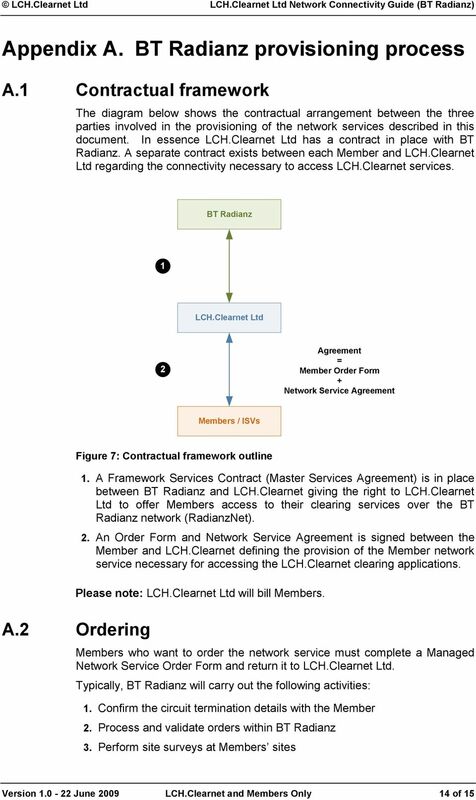 The contractual relationship relating to the provision of the network by LCH.Clearnet Ltd is governed entirely by the Network Services Agreement as executed by LCH.Clearnet Ltd and its clearing member(s) in advance of the provision of the network. 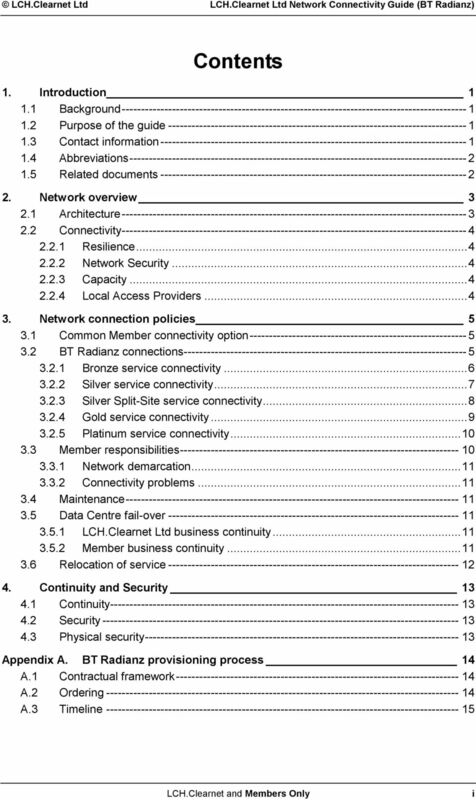 No party shall have any remedy in respect of misrepresentation or untrue statement contained in this Member Connectivity Guide (). 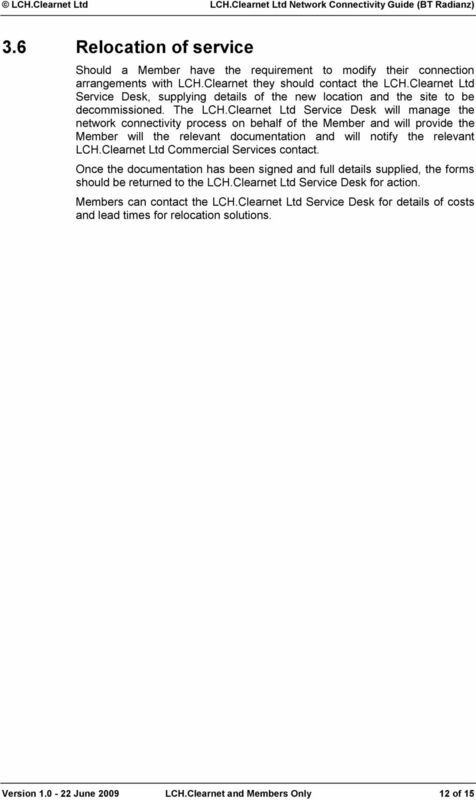 LCH.Clearnet Ltd and Members Only This document can be freely distributed within LCH.Clearnet Limited and Member organisations but should not be copied beyond these limits without the agreement of the information owner. 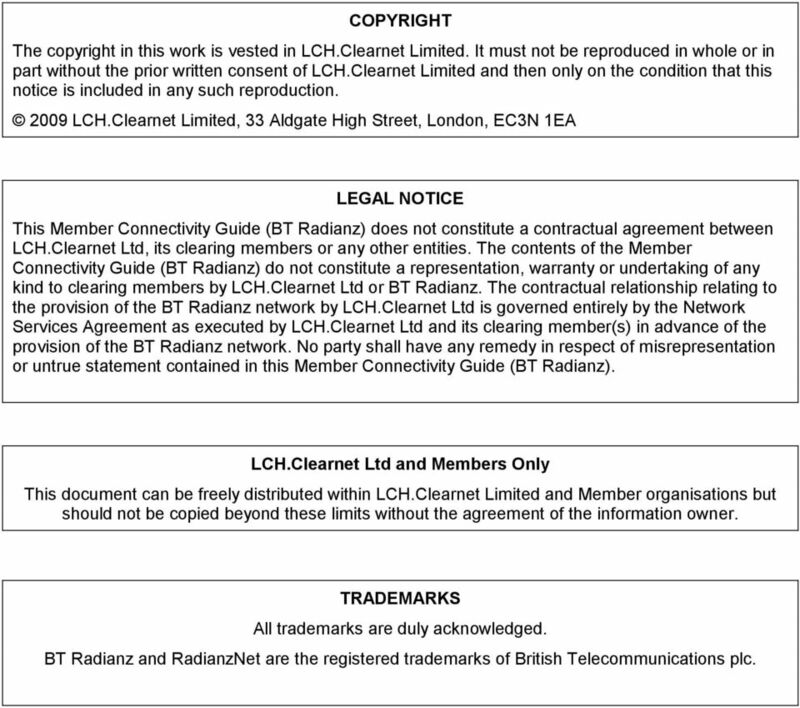 TRADEMARKS All trademarks are duly acknowledged. 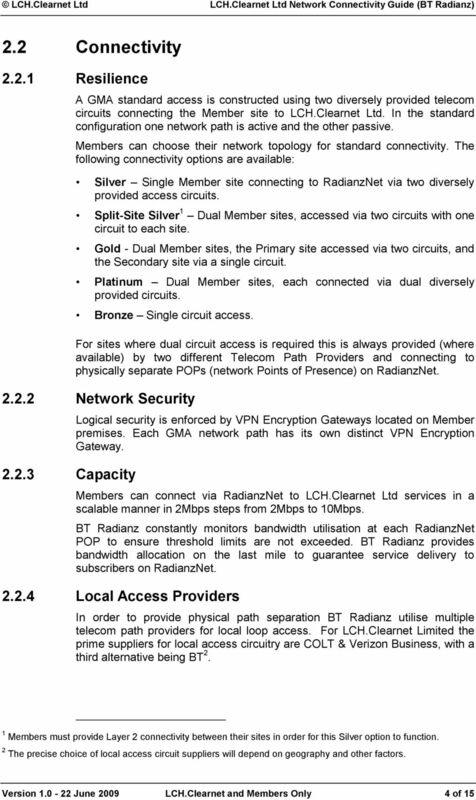 and RadianzNet are the registered trademarks of British Telecommunications plc. 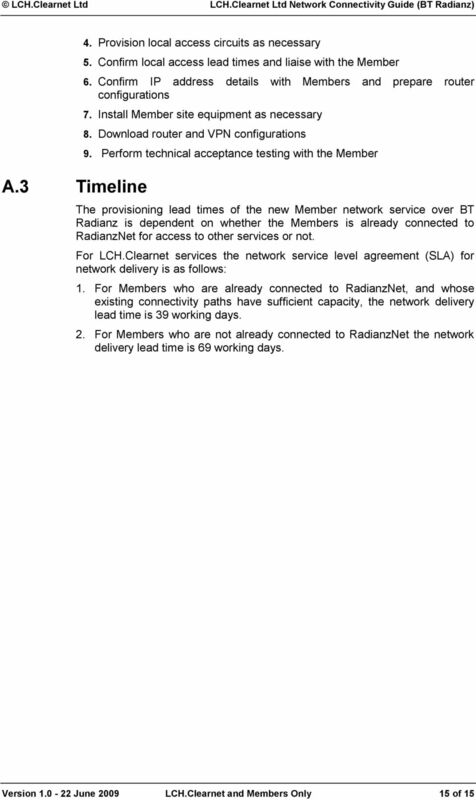 Any other capitalised terms have the meaning set out in the Schedule 1. 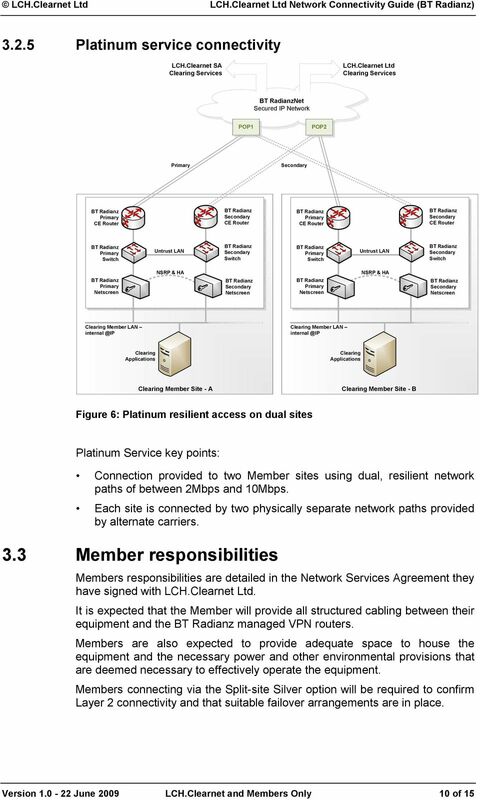 WANs connect remote sites. 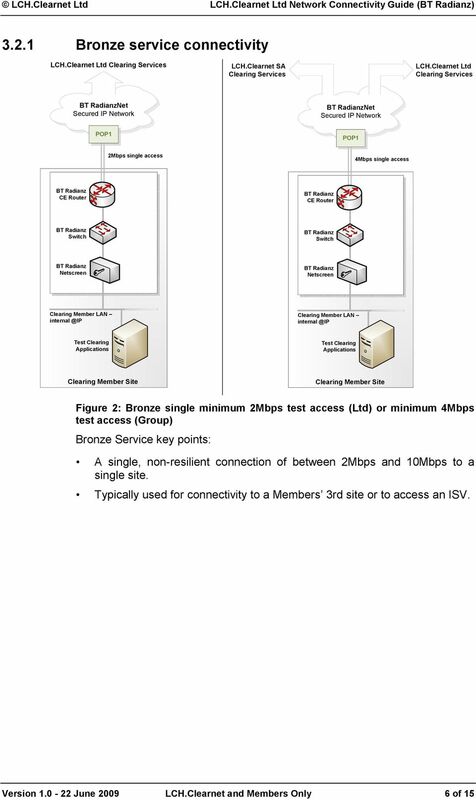 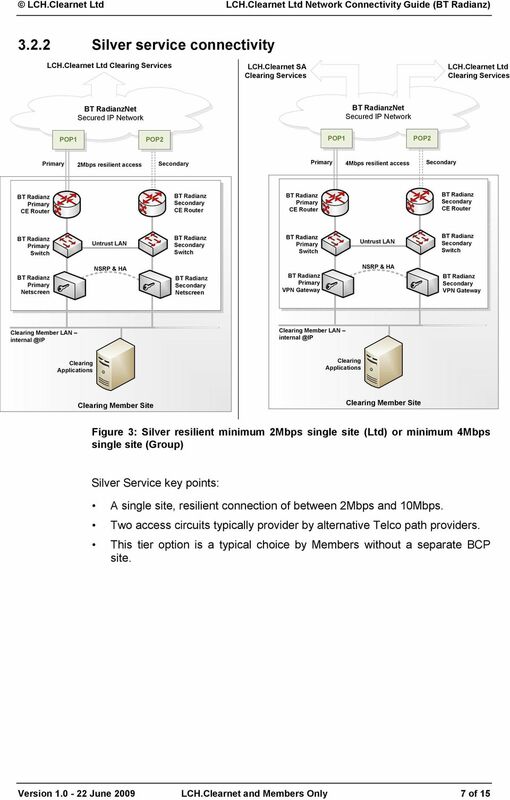 Connection requirements vary depending on user requirements, cost, and availability.